You have spent the last 3 agonizing days preparing a 60min presentation for your dissertation defense that runs into hundreds of megabytes. Tired, but not giving up, you go for 30 minutes quick reversals, only to realize that you have less than 40 minutes to submit the presentation to a dozen, mean supervisors before the actual presentations begin. You comfort yourself in that it will only take you a few seconds to attachment and send to your supervisors. So you hurriedly get back to your desk, open your Outlook, write down the email, attach and hit “SEND”. And, just before you yell “Yay!” you are greeted with this sickening “Attachment size exceeds the allowable limit” error? So, you freeze. And your spirits die down. That’s about how mean Outlook attachment size limit can be. what is the file size limit for outlook attachments? Outlook’s email client sets a maximum limit of 20 MBs for every email attachment for all versions. Whether you have attached a single mail or several of them, they won’t be delivered if they exceed the allowed attachment limit. Why do email server providers limit the attachment size? Theoretically, there is a limitation to the amount of data a person can be sent via an email. But in practices, most email services provide limit the size of attachments that are transmitted through their serves and email clients. Outlook allows only 20MBs while other providers like Google and Yahoo mail limit the size of attachments to 25MBs. Also, the email you send can’t be sent it the format you send it in. It must be encoded to email infrastructure friendly format. This encoding increases the size of the email by 33%. That means if you send the email exactly 20MBs it will end up 27MBs. What does tell you? If you are sending your photographer a couple of photos for your wedding for editing, they might reach him. So when you start sending over an email whose attachment exceeds the allowed limit, Outlook will suggest an alternative way – Microsoft’s OneDrive – to send your bulky attachment. Can bypass these maximum email size limits in Outlook? One of the easiest ways to fix this problem would be to resize the file. Compressing a file helps stave off about 20% of the original size of the file. If you are a Windows fanatic, open the folder containing the file you want to compress. Select the file, right-click on it and choose “compress”. Installing tools like Weight Diet for Outlook ensures that all outgoing attachments are automatically so that they have more chances to “fit”. What happens when the compressed file(s) still exceed the allowed attachment size limit? You can take your time to split them into the small bit and send each of them individually. If you have for instance a file sized 21 MBs that is bogging you down, you can use a compression tool like 7-Zip that will allow you to split the file into three 7MBs pieces. Why is it not good for you? It’s pretty time-wasting. You will have to spend a lot of time splitting up and sending the resulting files. You are giving more work to the recipients – the recipient must download the document, extract the files and piece up the presentation. 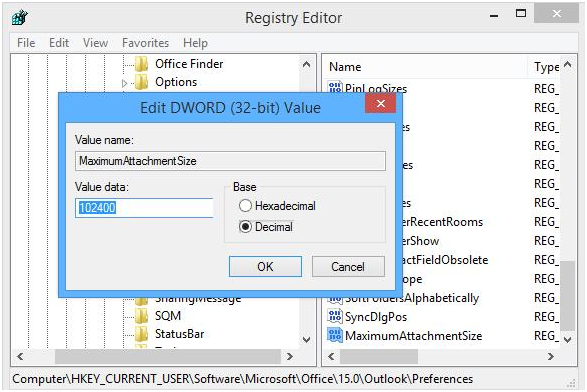 a) Press Windows + R keys simultaneously and type “regedit” to open the Registry Editor. c) In that branch, find and edit the value of Maximum Attachment Size by specifying your preferred attachment size limit. For instance, if you wanted to have the new limit as 100MB, you will edit the figure to 104200. 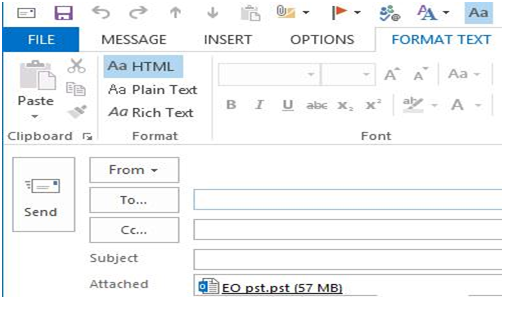 Change the value to 0 if you want to effectively disable the email attachment limit in your Outlook. 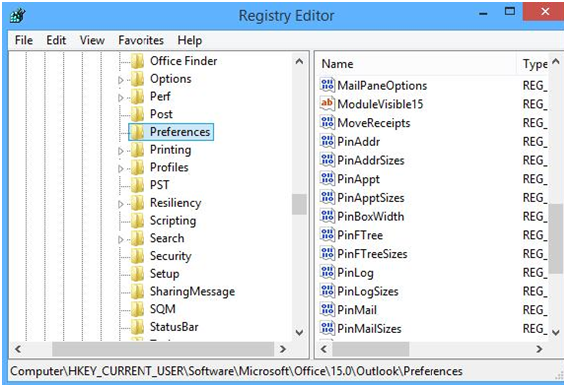 Now close the Registry Editor and fire your Microsoft Outlook. You can now attach files larger than 20MBs. Note: If your recipient or your mail server doesn’t support the size of the email you are trying to send, your email won’t be sent. For example, if you are sending 20MB using Outlook account for a Gmail account, your recipient will receive it. However, your recipient won’t be able to forward it other addresses. Using cloud-based storage and file-sharing services will help you to send too many (and too large) files easy. Such services – Dropbox, OneDrive ( if you are using Outlook.com) and SalesHandy – allows you to easily upload the files to the cloud and send the link to the file through email. However, SalesHandy offers you more than just file storage and sharing capabilities. So what happens to the email (and the cache of presentation documents) you just fired off to your supervisors? SalesHandy email and document tracking feature will notify you immediately when the document is opened, who opened it, the number of times the document was viewed and the time spent on on each slide. That way, you will prepare adequately for the presentations. If you are a marketer, you want to know how your campaign is fairing all along. SalesHandy allows you to track email opens, link clicks and the amount of time spent on the premium documents you shared. Using these insights, you can easily identify the leads with the highest sale-making potential and thus act accordingly. If you want to experience SalesHandy, sign up here for your free trial account.